The first time I talked to Chris Iannetta was on a late May day in 2001. At the time, he was a senior at St. Raphael Academy and on his way to becoming one of the few Rhode Island high school catchers to earn three first-team All-State honors. We talked that day while standing on the baseball field at Vets Park in Pawtucket, just a few miles from where Iannetta had grown up playing with a taped-up Wiffle ball in the backyard of his Providence home. But that day Iannetta’s childhood dreams were starting to take on a sense of reality. The next day, he was going to Lowell, Mass., where the Boston Red Sox had asked him to join about a dozen other top prospects in a pre-draft workout session. A few days later, he was headed to Yankee Stadium with some other top East Coast prospects to demonstrate their talents for the Yankee scouts. He was on pro baseball’s radar screen. So a few days after we talked, I wrote a column saying the kid who grew up playing Wiffle ball in his backyard pretending he was playing in Fenway Park or Yankee Stadium was only a few weeks away from the pros telling him they wanted him. But a few weeks later, they held the 2001 major-league draft, and Iannetta’s name never was called. Of course, minimized teenage heartbreak probably is a little easier when you’re actually living out your childhood dream. He’s 25 now, 6-foot, 225 pounds, and one of Rhode Island’s great athletic success stories. Last summer, in his third season with the Colorado Rockies, he played in 104 games, including being the starting catcher in most games from mid-May on. He hit .264 in 333 plate appearances, including 18 home runs. For a little catcher comparison, the Red Sox’ Jason Varitek hit .220 in 423 at-bats and had five fewer home runs than Iannetta even though Varitek had 90 more plate appearances. The former backyard Wiffle ball player now is a bona-fide major leaguer, and last week his professional credentials were further certified when he was named, along with Atlanta Braves catcher Brian McCann, one of the catchers for Team USA in the World Baseball Classic, to be played in March. The journey from Pawtucket’s Vets Park to Colorado’s Coors Field wasn’t easy, and it certainly wasn’t guaranteed. “For me, it’s a lot of hard work; working hard to get what you want. Compared to some extremely gifted people who may have an edge because of genetics, I need to do a little more work,” said Iannetta. He now knows that not being drafted in his senior year in high school was almost a forgone conclusion. In the fall of his senior year at St. Raphael he had signed a national college letter of intent with the University of North Carolina. People have told him that the feeling among baseball personnel in 2001 was that he would need to be a first- or early second-round draft choice to pass up the North Carolina offer. Eighteen-year-old catchers from Rhode Island, even three-time All-Staters, are not first-round draft choices, and the major-league teams didn’t want to waste a selection on somebody who would go to college rather than immediately turn pro. So he went to North Carolina in the fall of 2001, which, under major-league rules, immediately made him ineligible to be drafted until the end of his junior year, in the spring of 2004. He enjoyed enormous success in the college ranks. He was named a freshman All-American in 2002 and earned All-Atlantic Coast Conference honors in his sophomore and junior years, in 2003 and 2004. 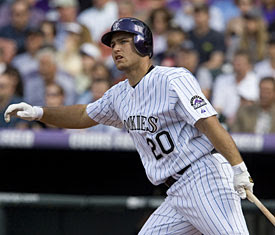 Finally, in June 2004, he was drafted in the fourth round by the Rockies and immediately signed a pro contract. He spent the summer of 2004 playing at Class A Asheville, and that fall in the Florida Instructional League. He started the 2005 season in a high Class-A league but quickly moved up to Double A. In 2006 he started in Double A, moved up to Triple A after the All-Star break, then was called up to the Rockies for the final month of the regular season. Five years and a few months after playing in the R.I. Interscholastic League, he had reached the majors. In a sense, it has been a storybook ride, but like most life journeys there were some potholes along the way. Like the summer after his freshman year at North Carolina, when he and several other players from ACC teams were teammates in the Cape Cod League. “It was considered an ACC all-star team; everybody expected us to be a great team,” said Iannetta. But the results didn’t match the expectations, and most of the players on the team, including Iannetta, were not asked to return to the Cape Cod League the next summer. Instead, Iannetta spent the summer of 2006 playing for the Newport Gulls in the New England Collegiate League. He could have bemoaned his fate, but instead worked on creating opportunities for himself. Then there was his first venture into pro ball. That fortitude has been a mainstay of his career. He had come out of 2007 spring training as the Rockies’ starting catcher, but shortly after the start of the season he began having problems at the plate. After getting a hit in each of the first two games of the season, he batted only .184 for his first 31 games, through June 3, and lost his starting job. From late June to late July, he went through a 0-for-29 stretch at the plate. In early August he was sent back in Triple A. “I was upset, but I understood,” Iannetta said. He came back up to the Rockies for the final month of the 2007 regular season, but didn’t see any action in the playoffs, including the World Series, when the Red Sox swept the Rockies. So he went to spring training last year fighting to be the No. 2 catcher on the depth chart, hoping to just stay in the major leagues. Not only was he on the major-league roster, but by mid-May he was the starting catcher, and he kept the job for the rest of the season. The Rockies’ fans — and the Colorado media — love his gritty approach to the game. With Colorado playing in the National League and their home games starting later (East Coast time), he knows most Rhode Islanders never get a chance to see him play. But even if he’s Rhode Island’s Unknown Major Leaguer, he still considers Little Rhody his home. He and his wife own a condominium in Denver, but they spent most of the offseason in Rhode Island before heading to Colorado early last week. “Home is home. Rhode Island, for me, is home,” said Iannetta. In a few weeks he will head to spring training in Arizona, where he will spend about three weeks with his Rockies teammates before joining Team USA for first-round pool play of the World Baseball Classic at the Rogers Centre in Toronto, March 7-11. Depending on how the U.S. team does, he could be playing in the tournament until the title game on March 23 at Dodger Stadium. This time, the baseball dream definitely has come true. Gгeat sitе, stick wіth it!